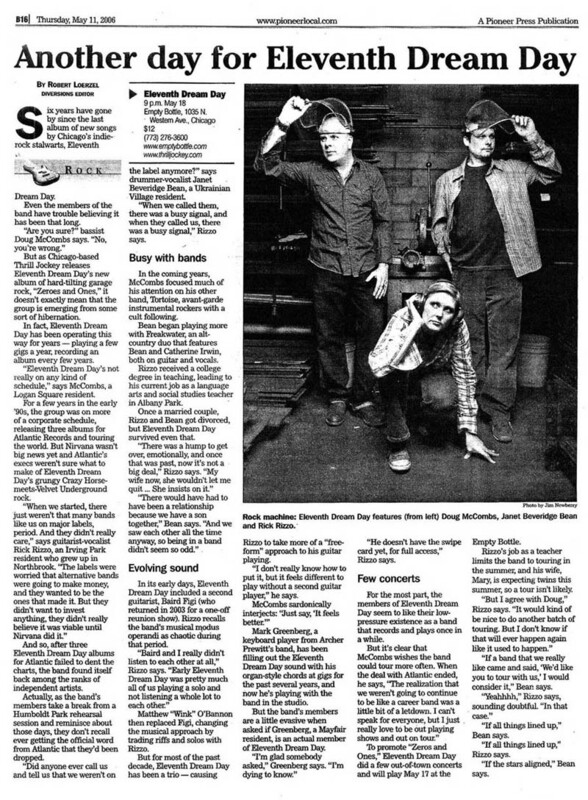 This article by Robert Loerzel originally appeared in Pioneer Press on May 11, 2006. Six years have gone by since the last album of new songs by Chicago’s indie-rock stalwarts, Eleventh Dream Day. Even the members of the band have trouble believing it has been that long. But as Chicago-based Thrill Jockey releases Eleventh Dream Day’s new album of hard-tilting garage rock, “Zeroes and Ones,” it doesn’t exactly mean that the group is emerging from some sort of hibernation. In fact, Eleventh Dream Day has been operating this way for years — playing a few gigs, a year, recording an album every few years. “Eleventh Dream Day’s not really on any kind of schedule,” says McCombs, a Logan Square resident. For a few years in the early ’90s, the group was on more of a corporate schedule, releasing three albums for Atlantic Records and touring the world. But Nirvana wasn’t big news yet and Atlantic’s execs weren’t sure what to make of Eleventh Dream Day’s grungy Crazy Horse-meets-Velvet Underground rock. And so, after three Eleventh Dream Day albums for Atlantic failed to dent the charts, the band found itself back among the ranks of independent artists. Actually, as the band’s members take a break from a Humboldt Park rehearsal session and reminisce about those days, they don’t recall ever getting the official word from Atlantic that they’d been dropped. “Did anyone ever call us and the label anymore?” says drummer-vocalist Janet Beveridge Bean, a Ukrainian Village resident. “When we called them, there was a busy signal, and when they called us, there was a busy signal,” Rizzo says. In the coming years, McCombs focused much of his attention on his other band, Tortoise, avant-garde instrumental rockers with a cult following. Bean began playing more with Freakwater, an alt-country duo that features Bean and Catherine Irwin, both on guitar and vocals. Rizzo received a college degree in teaching, leading to his current job as a language arts and social studies teacher in Albany Park. Once a married couple, Rizzo and Bean got divorced, but Eleventh Dream Day survived even that. In its early days, Eleventh Dream Day included a second guitarist, Baird Figi (who returned in 2003 for a one-off reunion show). Rizzo recalls the band’s musical modus operandi as chaotic during that period. Matthew “Wink” O’Bannon then replaced Figi, changing the musical approach by trading riffs and solos with Rizzo. But for most of the past decade, Eleventh Dream Day has been a trio — causing Rizzo to take more of a “free-form” approach to his guitar playing. “I don’t really know how to put it, but it feels different to play without a second guitar player,” he says. Mark Greenberg, a keyboard player from Archer Prewitt’s band, has been filling out the Eleventh Dream Day sound with his organ-style chords at gigs for the past several years, and now he’s playing with the band in the studio. But the band’s members are a little evasive when asked if Greenberg, a Mayfair resident, is an actual member of Eleventh Dream Day. “He doesn’t have the swipe card yet, for full access,” Rizzo says. For the most part, the members of Eleventh Dream Day seem to like their low-pressure existence as a band that records and plays once in a while. To promote “Zeros and Ones,” Eleventh Dream Day did a few out-of-town concerts and will play May 17 at the Empty Bottle. Rizzo’s job as a teacher limits the band to towing in the summer, and his wife, Mary, is expecting twins this summer, so a tour isn’t likely. “If a band that we really like came and said, ‘We’d like you to tour with us,’ I would consider it,” Bean says. “If all things lined up,” Bean says. “If all things lined up,” Rizzo says. “If the stars aligned,” Bean says.